The Unpacked event just went on. 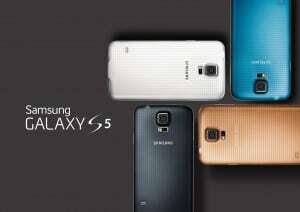 Samsung announced it’s latest flagship, the new Samsung Galaxy S5. This new device doesn’t have any high tech features that are hard to use. Samsung says that it’s customers want smartphones with simple and easy features with a big camera. Well, that what was Samsung brought at MWC in Barcelona. The new product from the Galaxy S line has a 5.1 inch display which is Full HD at 1920×1080,Super Dimming and Adaptive Display technology, AMOLED display with Local Contrast feature, a quad-core processor – Snapdrogon 801 SoC with 2.5 GHz, a Adreno 330 GPU at 578 MHz and of course 2 GB of RAM. S5 is waterproof and dustproof, so there won’t be an Active variant in the future. The best part of the new Galaxy S5 is the camera, a 16 MP camera sensor with 4 K video at 30 FPS and 1080p at 60FPS. At the software level, there are a lot of new shoot modes for this new type of camera. This 16 MP camera is the fastest camera on an phone, as the shutter speed is reduced to 0.3 seconds. Also it has a image processing chip especially for the camera. S5 has a 2.1 MP front camera which is good to video calling or conferences.